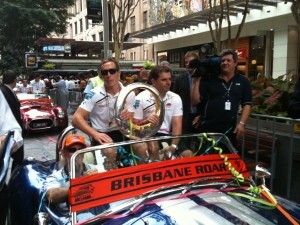 Brisbane Roar fans used today’s ticker tape parade to plead – in vain – with coach Ange Postecoglou to stay with the club for a shot at a third straight championship. Premier Campbell Newman and Lord Mayor Graham Quirk presented players with a special certificate in a ceremony at King George Square following the parade through the Queen Street Mall. Ange Postecoglou said “Orange Sunday”, the day of the team’s controversial A-league grand final 2-1 win against Perth, would go down in folklore as a big part of Australian sporting history. He paid tribute to the team and backroom staff for their work throughout the season. “This team has worked really hard to belong to the city and hopefully to make the city proud of our achievement,” he said. Mr Newman said he couldn’t wait to see if they could make it three-in-a-row in 2013. “It’s fantastic that we have a great footy team that had done well for the second year running,” he said. Cr Quirk said he was proud of the Brisbane team. “They’ve learnt to wear their heart on their sleeve following on from last year’s final where everyone had given up on them. “Again this year they left it to the last few minutes to do the deal,” he said. Brisbane Roar will be back in action against FC Tokyo in Japan on May 2 but will be back on home turf on May 16 for the final group match against Beijing Guoan. However they will be without Mr Postecoglou, who today announced his decision to resign, effective immediately. He is expected to be appointed head coach of Melbourne Victory.